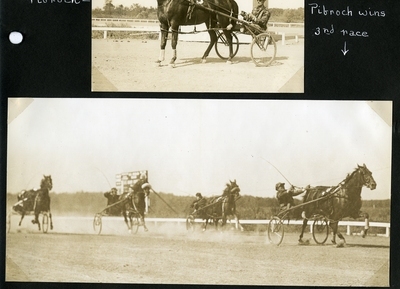 Sepia tone photograph of the field of horses in the first heat of the 2.24 Class Pace at the Old Orchard Beach Mile Track Association races on Monday, June 22, 1936. Pibroch, F. Scroggins up, claimed both heats of the race. Other horses in the field included Keystone Hanover finishing second, Princess Scott in third, and Janie Scott finishing in fourth place.